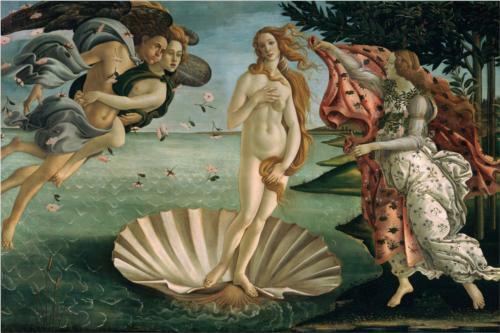 Wave Power Conundrums: Botticelli's Venus: nice goddess, pity about the waves. Botticelli's Venus: nice goddess, pity about the waves. You know you've reached the room that houses Botticelli’s Venus by the crowds of people obscuring the view of the painting. It is certainly stunning from up close though. Like a beauty spot, this painting is all the more beautiful for it's flaws. Consider the half-shell. Does it displace enough water to support the goddess? I'd say marginally, and only in the absence of a dynamic response induced by the waves. We observe the presence of waves, and yet the distinct lack of water in the shell. The waves themselves are not quite right. They appear to be short-crested trochoidal waves, but scaled down to a smaller scale than the rest of the picture. They demonstrate unsettling refraction behaviour: a sudden 90° change in direction, and they remain short-crested even once they are travelling towards the beach.